Oil and water don’t mix well and we often assume that molded seating and movement don’t mix either. Why? Well, a molded seat or back provides very intimate contact with the client’s body. If, for example, the seat to back angle changes, this can change the alignment of the client in relation to these intimate contours. A client may not remain in alignment with a molded back when extending and may experience increased shear forces in relation to the back due to this movement and force. By providing movement in response to force, alignment may actually be improved and these shear forces decreased. A molded back can generally be used with a Dynamic Rocker Back Interface for two reasons. First, the seat to back angle only opens approximately 10-15 degrees. This amount of movement leads to a minimal amount of shear, allowing the client to remain in alignment with the contours of the back. Second, the Dynamic Rocker Back is mounted with a pivot point that matches the client’s natural pivot point at the hip, further reducing shear, and allowing the client to remain in alignment with the contours of the back. The molded back needs to be separate from the seat in order to allow this movement. Use of a molded back and Dynamic Rocker Back may not be appropriate for a client who is at higher risk of pressure injury; however, these clients are unlikely to be extending with force at the hips. Lilly is positioned in a linear seating system. She needs significant postural support due to high tone in her extremities and low tone in her trunk and neck. She also requires significant contact to reduce overall extension. Finally, Lily is at risk of developing further scoliosis as she grows, due to postural collapse of her trunk and the influence of abnormal muscle tone. Significant contact with the seating system is required to maintain alignment of the trunk. For these reasons, a molded seating system was recommended. 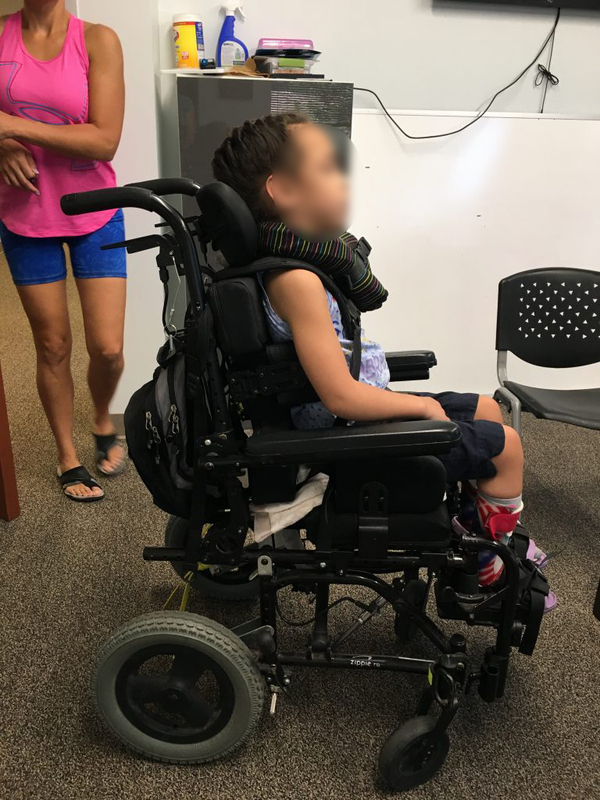 A dynamic backrest and footrest hangers were also recommended to absorb extensor forces, to reduce her extension and increase her sitting tolerance.